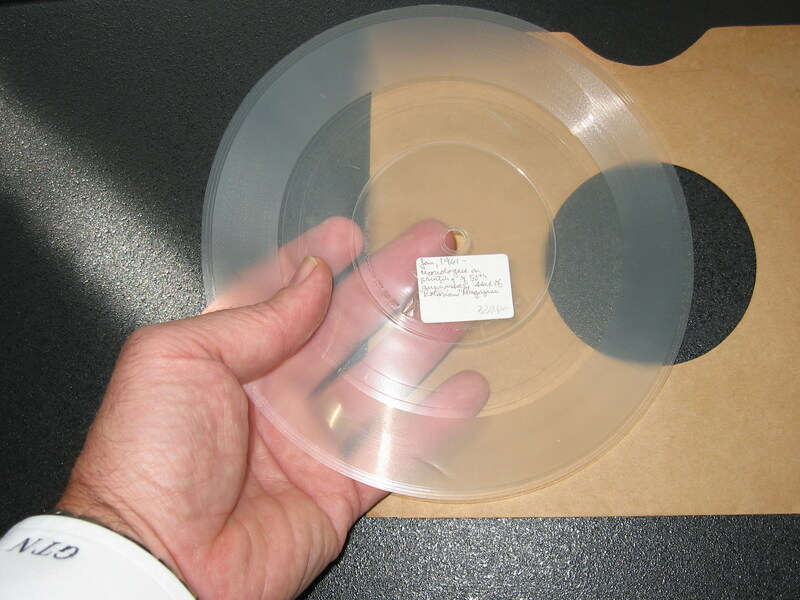 This is a photo of an acetate found in an old record collection. 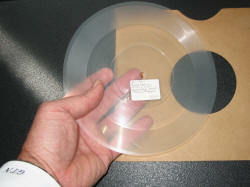 It is a 7" recording played at 33 rpm. To see the acetate in a second, larger window, click on the photo on the left. Click to hear this recording! The first half of this 6-minute recording is a monologue by Carl Kruger, Editor of the Rotarian Magazine, discussing the production of the January 1961 issue, which marked the magazine's 50th anniversary. He spoke from the printing plant in Chicago, where the magazine was being produced at the rate of 4000/hour. The initial print run of 392,000 copies took 5 days to complete. Editor Carl noted that the first issue in 1911 printed only 4000 copies, more than enough for the 16 Rotary clubs then in existence. Next, we are introduced to R.I. President J. Edward McGloghlin, who praised the magazine and concluded with a challenge "...to higher business standards, as you work to enlighten human relations, and improve your community, and try to help being a bit of understanding into this world." President Ed ended the recording by reaffirming: "You are Rotary." At The third meeting of the Board of Directors of R.I. in 1999-2000 (1-5 November 1999), the Board selected an arrangement from the "march" of the Overture to "Egmont" Op. 84 by Ludwig van Beethoven, as the Rotary anthem, which can be played at appropriate occasions, such as flag ceremonies. Bet you didn't know that there is an official Rotary Anthem! At the third meeting of the 2003-04 RI Board of Directors (23-28 February 2004), the Board confirmed a special arrangement of the march from Beethoven's Overture to "Egmont" as the Rotary anthem. RI is commissioning an original recording of the anthem so that it can be made available for sale to Rotarians. Click to hear the Rotary Anthem. This is a recording of Paul P. Harris' speech to the Boston Convention in 1933, marking Rotary's 28th anniversary. Members from over 40 countries attended. This MP3 recording is truncated, however, but you can still hear about 3 minutes of Paul Harris' voice. He talked about the 2 unique features of Rotary: the "classification" plan, which limited membership to one per line of trade or profession; and (2) the provision that membership is open to anyone qualified, without regard to racial, political or religious standards. So Rotary is open to representatives from all walks of life, from all countries, from all religions. Click to hear Paul Harris.